We provide the very best dog home boarding near you in North Bristol, Stoke Gifford, Keynsham and the surrounding areas. Dogs deserve a holiday too! 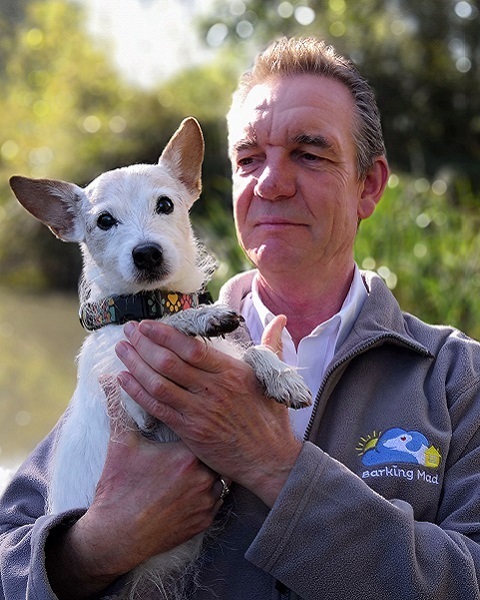 I’m John and along with my partner Ros, I have loved running the North Bristol franchise of Barking Mad Dog Care since taking over from Julie in November 2015. Having used Barking Mad for our own dog, who would be happiest around people, and having hosted dogs too, we knew that it was the ideal job for us. We provide one to one dog home boarding from Thornbury down to Saltford and from Pilning across to Frampton Cotterell. We really enjoy offering a bespoke one to one home dog boarding for friendly, well behaved family pets; staying with exceptional, dog loving hosts. We will collect and return your dog, with all it needs for the holiday, in our Barking Mad car. Your family dog becomes part of our Barking Mad family when they go on holiday. We understand how it feels to send your dog off on holiday for the first time, because Holly had always stayed with a family member; but we needed dog holiday care for her when we went to a family wedding. She enjoys her dog holidays and going for walks with new friends. It is such a relief to know that she can go to a caring family whilst we have a relaxing holiday. She also enjoys having new friends to stay. When we meet with you to register your dog initially, we will ask you to tell us everything about your best friend. We can then match your dog to the host best suited to provide for their requirements and give the host a Pet Schedule to follow so that your usual routine is followed. Your dog will have a meet and greet trial stay with their host, prior to the main holiday. The host will love and care for your dog just as you do and will look forward to seeing them again; and your dog will have a great holiday and be excited to see the host next time! We wait to see your dog has settled before we leave it with the host and send you a photo. We check the next day and email you to reassure you. The host often takes photos during the holiday, for us to pass on to you. The host also helps your dog to complete a postcard to say what it has been doing on its holiday! Our customers have found that the dog holiday care we offer is so loving that it is easier to book the next holiday with complete peace of mind. Would you like to host a dog in your home when the owner goes on holiday? We also understand what it is like to be a host for Barking Mad; the visiting dog becomes part of your family and it can be hard to say ‘Goodbye’ when it is time to for them to return home! Hopefully, it won’t be too long until your next doggy visitor arrives! We are available 24/7 to support you and you will have a Handbook full of helpful tips. As a Barking Mad host, you will offer a 5 star, one to one home boarding holiday care for our dogs. You will also have opportunities to meet up with other hosts now and again. If you would like to say goodbye to ‘doglessness’ and enjoy having a lovely dog in your life now and again, please contact me.